This cake has a hole in it. A couple of weeks ago, my sister and I went to our first meeting of the LA Cake Club. It is just what you think…a group of people get together and share their delicious homemade sweets. We had a sufficient sugar high by 2 pm, so not a bad Saturday afternoon. It was hosted at a great organization, the Made by DWC (Downtown Women’s Center). “MADE by DWC is a social enterprise created by the Downtown Women’s Center to break the cycles of chronic unemployment and homelessness by empowering women to discover talents and develop skills through vocational opportunities, and generates economic and social capital to support programs at DWC.” I encourage you to visit their website to learn more if you are interested in getting involved. We met one of the participants and she was so excited to tell us about the organization. 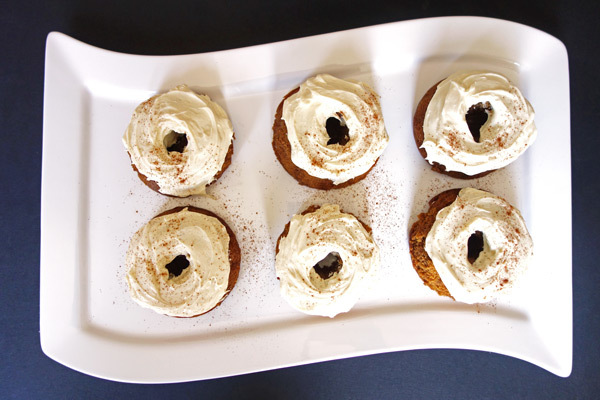 My contribution to the Cake Club were these mini Sweet Potato Bundt cakes. You know how much I love sweet potatoes and let me tell you, these cakes almost didn’t make it to Cake Club. They are soooo good. They’re light, moist, and not overly sweet. Move over pumpkin, these sweet potato cakes can put you out of business. This was the scene at LA Cake Club. That delicious bundt cake in the foreground was make by Jamie of Paint the Gown Red. I wish I remembered everyone so I could lead you to the other cake club ladies. I was surprised there were only two men at the cake club. I mean, what man doesn’t love the chance to eat a bunch of dessert with little to no effort? At this point, you know the drill with baked goods. Beat the butter and sugar on medium speed until smooth. Please don’t try to get creative and use white granulated sugar. Use brown sugar. Only brown sugar. Add the eggs and vanilla extract and beat until evenly incorporated. In separate bowl, you’re going to mix the dry ingredients. Mix the flour, baking soda, salt, ginger, cinnamon, and nutmeg. Slowly mix flour mixture into the creamed butter and sugar. Pour batter in mini bundt pans about 3/4 full. If you don’t have mini bundt pans, you could make these into cupcakes instead. Not as cute, but just as good. You’ll notice this recipe made nine bundt cakes, but only 6 made it to cake club. Yeah, my sister, boyfriend, and I may have done too good of a job taste testing. Bake cakes for 15 minutes or until toothpick comes out clean. Try to contain your excitement and let the cakes cool before you frost them. Drooling. While cakes cool, cream butter, cream cheese, and vanilla in medium bowl until smooth. Add powdered sugar, 1/2 cup at a time. Beat on medium speed until smooth. Frost the cakes and sprinkle a little cinnamon to finish it off. I can’t even explain how good these taste. You need this in your life. Preheat oven to 350 degrees. Lightly spray mini bundt pans and arrange on baking sheet. Beat butter and sugar on medium speed until smooth. Add eggs and vanilla extract and beat until evenly incorporated. In separate bowl, mix flour, baking soda, salt, ginger, cinnamon, and nutmeg. Slowly mix flour mixture into butter mixture. Add mashed sweet potatoes and beat until combined. Add buttermilk and beat until smooth. Pour batter into prepared bundt pans. Bake cakes for 15 minutes or until toothpick comes out clean. Let cakes cool before icing. While cakes cool, cream butter, cream cheese, and vanilla in medium bowl until smooth. Add powdered sugar, 1/2 cup at a time. Beat on medium speed until smooth. Frost bundt cakes with cream cheese frosting when cooled. Um this looks amazing….what a great idea to use sweet potato!!! Without a doubt some of the best cake I have ever tasted! I am not a huge cake person, but I could not stop eating this! It is great with or without the icing. Definitely going to hold on to this recipe for future events. Thank you so much for sharing!